Jesus Christ, true God and true man, is the only Savior from sin (John 1:1-3, 14). By His perfect life and sacrificial death, He won the forgiveness of sins for everyone (1 John 2:2). Jesus rose from the dead on the third day (1 Corinthians 15:3-5); and now reigns at the right hand of God, Lord of all (Ephesians 4:10-12). We are justified, or declared not guilty, in the sight of God and rescued from sin, death, and damnation, not by our works, but by God's undeserved kindness (grace), given as a free gift through faith in Jesus Christ (Romans 3:21-28). The forgiveness of sins, eternal life, and salvation, are offered and delivered to us through the Gospel, that is, in the preached and written Word, in the Holy Absolution, in Holy Baptism, and in the Lord's Supper (Luke 24:47; Matthew 28:19; John 20:21-23; 1 Corinthians 11:23-26). The Christian life is one of repentance and faith (Matthew 12:33). Good works are the fruit of faith in Christ (John 15:5). Holy Scripture is the written Word of God, without error and the only source, authority, and judge of all teaching and practice (John 5:39). 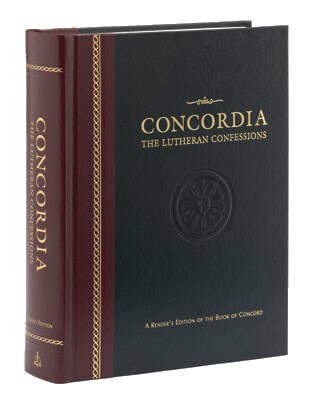 For a complete statement of our beliefs, see the confessions of the Lutheran church in the Book of Concord. You can purchase a copy from the publisher here or on Amazon here, and you can read it online for free here.